Youcun Qian’s group of the Shanghai Institute of Nutrition and Health, Chinese Academy of Sciences, published their latest research entitled “Dysregulated Lung Commensal Bacteria Drive Interleukin-17B Production to Promote Pulmonary Fibrosis through Their Outer Membrane Vesicles " in the international academic journal Immunity on February 26, 2019. 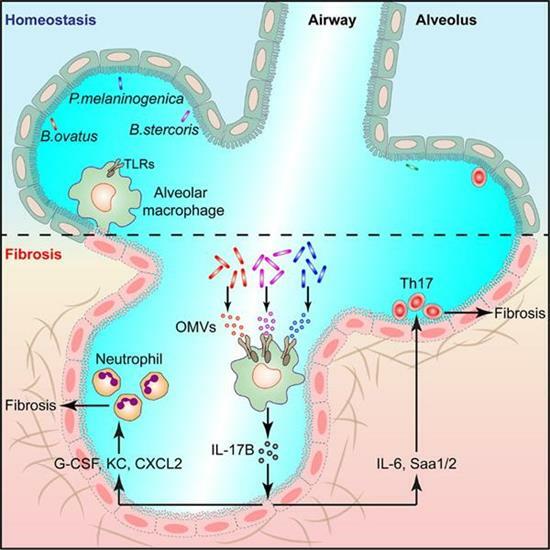 Their study systematically analyzed the microbiota changes in lungs of mouse with pulmonary fibrosis and found that Bacteroides and Prevotella were significantly increased and could secrete Outer membrane vesicles (OMVs) to drive the production of interleukin-17B (IL-17B) to promote the pathogenesis of pulmonary fibrosis. The study also revealed the molecular mechanism of interleukin-17B in regulating the pathogenesis of pulmonary fibrosis，indicating IL-17B is a potential new target for the treatment of pulmonary fibrosis. Mucosal microbiota has been a research hot area for its important roles in host immunity. It has been proved to be involved in both the immune homeostasis and diseases of various mucosal tissues. Over the past several years, Dr. Qian’s group has focused on studies about the interactions between mucosal microbiota and interleukin-17 family cytokines. On one hand, disorders of microbiota in colon can drive IL-17C to promote the development of intestinal cancer (Song, et al., Immunity, 2014), on the other hand, the commensal bacteria in the intestine can also drive IL-17A production to promote intestinal injury repair (Song, et al., Immunity, 2015). However, the potential roles of pulmonary microbiota in lung tissue remain unclear. Through high-throughput sequencing, Dr. Qian’s group found that there was relatively abundant microbiota in mouse lung tissue under homeostasis, but in the pathological tissues of pulmonary fibrosis, the microbiota was obviously disordered, which was crucial for the pathogenesis of pulmonary fibrosis. Subsequent studies found that the pulmonary microflora promoted the development of pulmonary fibrosis by inducing the expression of IL-17B. Lung microbiota-depleted mice, germ free mice and IL-17B-deficient mice all showed reduced phenotypes of pulmonary fibrosis. Further studies identified that Bacteroides and Prevotella bacteria were significantly elevated during pulmonary fibrosis and could promote IL-17B secretion by secreting OMVs. Using bone marrow transplantation, cell sorting and other experimental methods, they found that IL-17B was mainly produced by alveolar macrophages, OMVs out of the dysregulated lung microbiota induced IL-17B expression through TLR2 and TLR4 receptors of alveolar macrophages, and the OMV components such as lipopolysaccharide and lipoprotein were involved in the IL-17B induction. In addition, their study also found that IL-17B could directly act on lung epithelial cells to induce the expression of downstream genes to promote the recruitment of neutrophils and the differentiation of Th17 cells and consequently the development of pulmonary inflammation and fibrosis. In summary, the study reveals the function and mechanism of the local pulmonary microbiota bacteria in regulating lung mucosa-related diseases, especially pulmonary fibrosis, and provides new ideas and therapeutic targets for clinical treatment of the associated diseases. Daping Yang, a postdoctoral fellow at the Shanghai Institute of Nutrition and Health, Chinese Academy of Sciences, is the first author of the paper, and Dr. Youcun Qian is the corresponding author. Dr. Xinyang Song from Harvard Medical School, Professor Jiangye Chen from the Institute of Biochemistry, Professor Honglin Wang from Shanghai Institute of Immunology, and Dr. Li Li from Shanghai Shuguang Hospital Baoshan Branch helped with this research. Funding support comes from the National Natural Science Foundation of China, the Ministry of Science and Technology, the Chinese Academy of Sciences, etc., and the research is also assisted by the Shanghai Institute of Nutrition and Health's public technology platform and animal platform. The model of lung microbiota to promote fibrosis. During lung fibrosis, pulmonary commensal bacteria are dysregulated. The upregulated microbiota bacteria as shown with three species can secret OMVs to drive IL-17B production in alveolar macrophages, and IL-17B can consequently act on lung epithelial cells to induce downstream genes expression for neutrophil recruitment and Th17 cell development to promote the pathogenesis of pulmonary fibrosis.